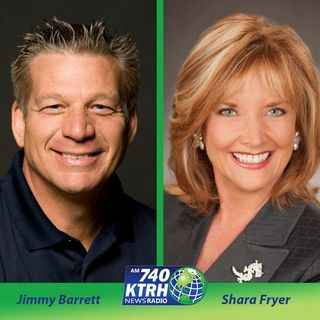 Jimmy Barrett and Shara Fryer take you through the stories that matter on the morning of 03/22/2019, including: The Coalition for Fair Drug Prices—consisting of 12 organizations representing health care consumers, labor unions and health care providers—releases its Statement of Principles for prescription drug policy. The coalition’s goal is to hold policymakers responsible for enacting policies that will prevent high and rising prescription drug prices. America: stop apologizing! Stop ... See More apologizing for being successful, for believing in God, for loving your country, for respecting your rivals, for everything you did or said when you were a teenager, for speaking your mind and – for apologizing. Stop cowering before the radical correctness police whose legitimacy depends on depicting our nation as a cesspool of racism and inequity. Elizabeth Warren is calling for an end to the Electoral College. She argued that presidential nominees no longer campaign in places like California and Massachusetts because they’re not swing states, instead focusing on battlegrounds that are up for grabs. That's true, but if you abolished the college tomorrow, candidates would camp out in such megastates as New York, California, Florida, and Texas in an effort to run up their popular vote totals. The college forces them to move around the country, especially to smaller states whose handful of electoral votes could tip the balance. Meanwhile, Warren has been joined by Kamala Harris and Kirsten Gillibrand in pushing to expand the Supreme Court. The three 2020 contenders told Politico they support the idea, which Warren said would be about "depoliticizing" the high court. But this is all too reminiscent of FDR's court-packing scheme, which was a political failure. Some Democrats want 15 justices on the court. They obviously see this as a way to correct the fact that the court now has a clear conservative majority. Texas senate approves bill to allow dogs at restaurants. Senate Bill 476 is based on a 2006 ordinance in the city of Austin. SB 476 includes certain guidelines: Only restaurants where food is not prepared on the patio can file for this permit. Canines are welcome only at patios, and only if they do not have to enter through a restaurant interior in order to access the outside area. Lastly, dogs must also remain leashed the entire time they're on the restaurant's premises.